Before its purchase in 1971 by Milos "Sharkey" Begovich, Sharkey’s was a landmark property with a colorful history. The “corner saloon” was originally constructed in the late 1890s. The surrounding buildings included a drug store, blacksmith shop, and mortuary at that time. C.M. Krummes operated the blacksmith shop and mortuary, and served as the first chairman of Gardnerville town board in the early 1900s. After it's purchase by Mr. Begovich, Sharkey’s quickly gained a reputation for serving the best prime rib in Northern Nevada as well as being the locals casino. 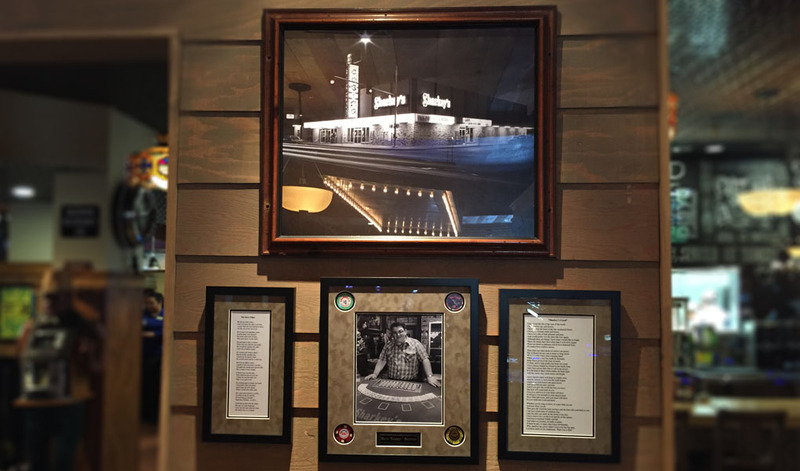 Milos “Sharkey” Begovich is as much a part of the history of the Nevada gaming as the building is. Former part owner of the South Tahoe Nugget, Sharkey loved the old West and built an unofficial "museum" of Western artifacts and memorabilia on display. Sharkey was one of the pioneers of Northern Nevada gaming, counting among his many friends: Bill Harrah, Charlie Mapes, and Harvey Gross.